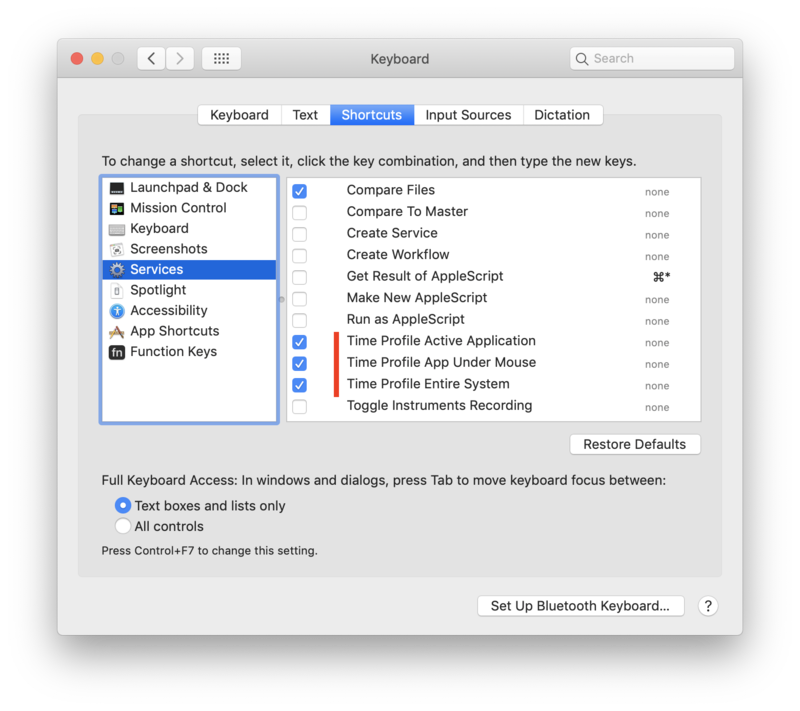 In System Preferences > Keyboard > Services > Development, I see options for 'Time Profile Active Application', 'Time Profile App Under Mouse', and 'Time Profile Entire System'. I've searched Google for "Time Profile" and "Time Profile Active Application", but no results show for that. Well, the later shows 4 total results on the interwebs, which none are useful in explaining what the program is. I'm on MacBook Pro Mojave. I happened to find these options when I was adding the Finder right-click option for 'New Terminal At Folder'. After enabling all of them, I didn't see any new options related to 'Time Profile', but I do see the Terminal option. Not the answer you're looking for? Browse other questions tagged macbook mojave .